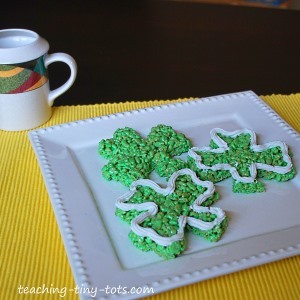 Toddler Recipes: Color rice krispies green and make shamrock treats. A cute St. Patrick's Day treat perfect for a party, classroom celebration or just for fun! Melt margarine or butter in large saucepan over low heat. Add marshmallows and stir until completely melted. Add a few drops of green food color. Stir until well blended, add a few more drops if you would like a darker color. Press cookie cutter into the Rice Krispies and pull away excess, then lift up the cookie cutter. Children can help cut the Shamrocks as mixture will have cooled sufficiently after shaping. Reform into a flat surface with the excess and repeat with the cookie cutter. Note Let Rice Krispies cool for about 30 seconds to one minute before handling. If you wait too long it will harden and be difficult to shape. Spray hands with Pam or put a little butter on your fingers when shaping the Rice Krispies. We used a Wilton shamrock cookie cutter. It will make about a dozen shamrock krispies. Make a party platter with a colorful Easter tray full of treats! 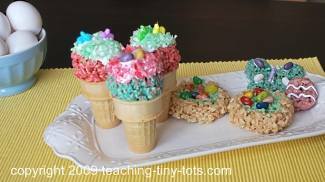 See Easter Ice Cream Cones for ideas using colored Rice Krispies Treats. Although an adult will be doing the heating of the marshmallows, writing out the recipe for your child to follow and measuring the ingredients on the is a great visual learning opportunity. as you make the Rice Krispies treats. Great opportunity to discuss colors and shapes.